This weekend we tried out a more extensive play through of free to play browser RPG Game of Thrones: Ascent (check out our first look video) an intriguing mix of RPG meets Empire building strategy combined with the added flavour of a Choose Your Own Adventure; it’s like no game we’ve played before. No doubt obvious by the title the game is based on the George RR Martin novels series’ A Song of Ice and Fire, or to those who have only seen the TV adaptation Game of Thrones, transporting players to the realm of Westeros and beyond, taking place at the beginning of book one/the first season where Robert Baratheon sits as King of the Iron Throne and after John Arryn, his Hand of the King, has died and Robert travels to Winterfell to enlist Ned Stark into the new role. It was with absolute caution and trepidation that we checked out this game, we absolutely loathe spoilers and weren’t sure whereabouts the game was initially going to take place within the series’ timeline. Thankfully it is pretty early on, though anyone a little behind watching the TV show or reading the books we would definitely say to give this game a miss for a while unfortunately as it does revolve around many of the key events that make up the series with those and everyone else playing the part of a newly titled Lord ruling over our new House and existing on the outskirts, as well as playing key roles, many such events. As soon as you begin the game you must choose the name of your Lord or Lady that will be the head of your new House, complete with your own banner that you are able to design and control of your own holdings that you can name. This begins the initial workings of the RPG element of the game where players can begin to immerse themselves in the world and take their place among some of the other famous Houses in an eventual bid for the Iron Throne. As you level up you unlock more features, early on we were able to align ourselves to one of the nine surviving Major Houses during this period (Stark, Greyjoy, Lannister, Baratheon, Martell, Tully, Arryn, Tyrell and Targaryen); always having a penchant for being ne’er do wells we chose the Lannisters’ (Booo! Hisss!) Each House has their own perks and talent tree that they offer up to players, for us the Lannisters’ as the wealthiest family in Westeros would give us gold mines and ways to increase our income. 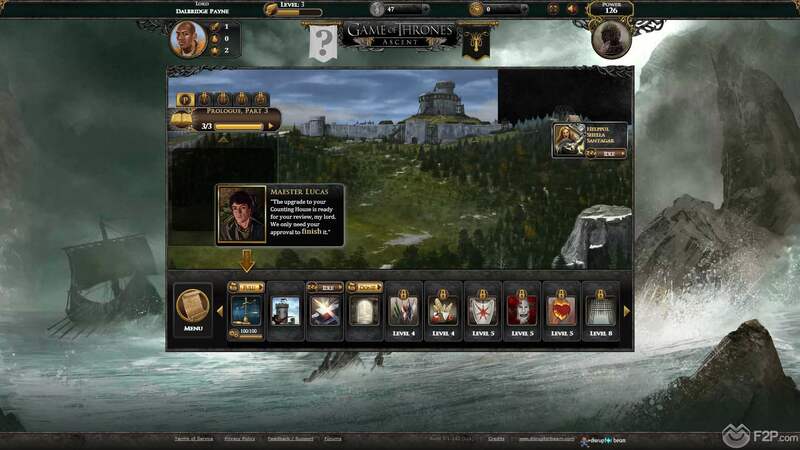 Depending on the House you choose also determines which characters you directly interact with and the primary story arc that you unlock, we were able to meet with Tyrion Lannister for a mission as well as accompany King Roberts train to Winterfell as he went to meet with Ned Stark, as well as catching the Queen and Kingslayer in a compromising position in the woods. 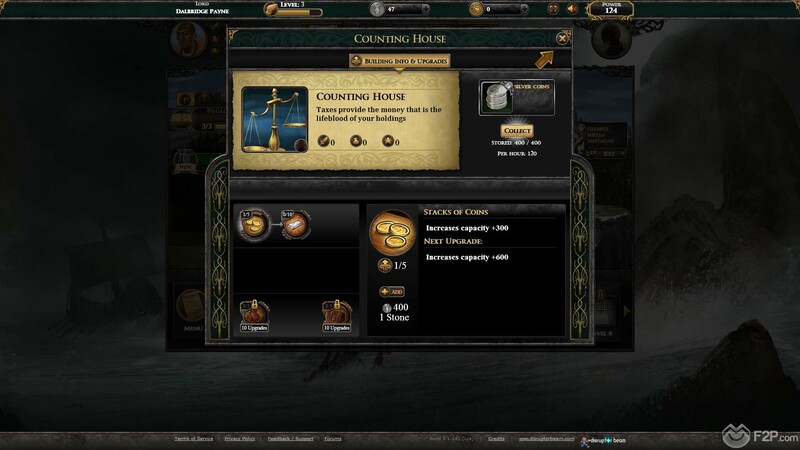 One of the primary principals revolves around being given tasks, quests and missions from all types of NPC’s and as the player making a decision on how you want your House to handle a situation, typically having three different choices which will grant rewards and also take a step towards defining your alignment (see below). 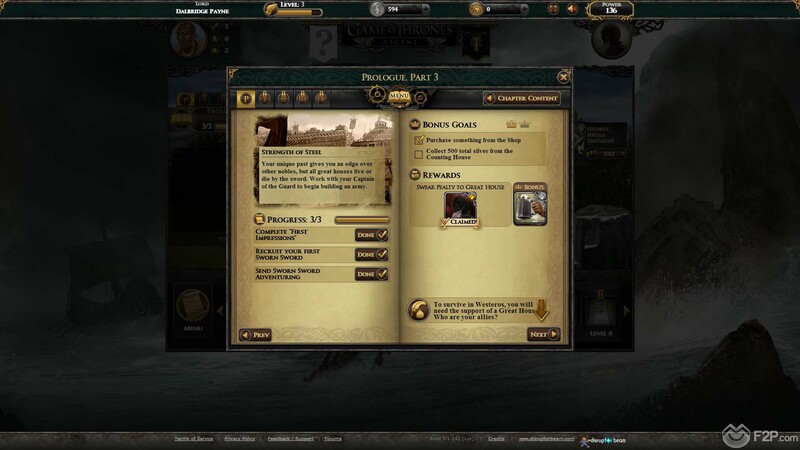 This is then primary RPG element to the game, some of the options allow players to dig a little deeper and get more information simply to discover more lore and immerse themselves more in the story and setting. 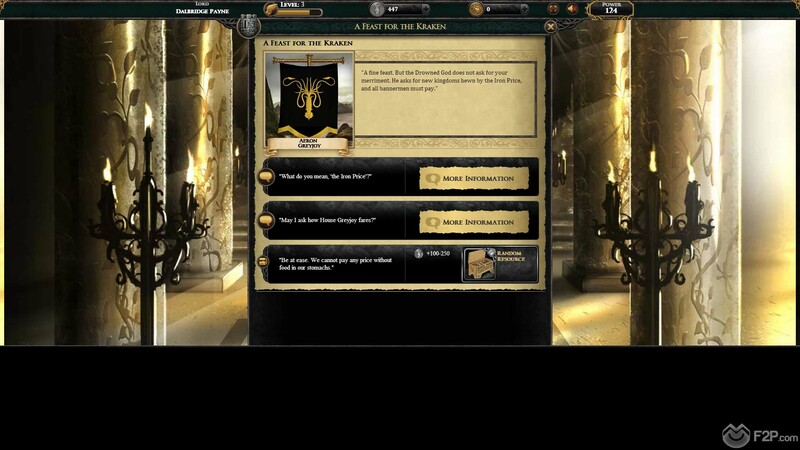 Such tasks as choosing how to deal with a deserter from the Nights Watch or diplomacy with other House Lords, each option typically revolves around advice from one of your NPC advisers. There are three different types of alignment, each with two opposing principles that players will shift between based off their choices during missions and the actions they take; the Old Ways or the New Ways, Family or the Realm, Cunning or Truthful. Primarily the alignment is simply a role-playing device that allowed us to examine other player Houses and see which players might share similar principles as us and make a viable future allies. 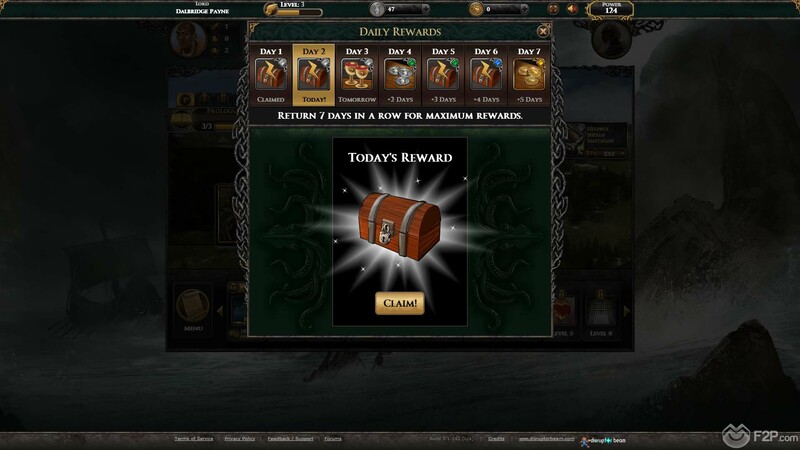 However, your Alignment can also trigger unique events/missions every so often and provide different rewards, as well as the fact that as we were focusing on on raising the Old Ways, The Realm and Cunning it meant we took actions in tasks that reflected that and so drove the storyline in a specific direction. 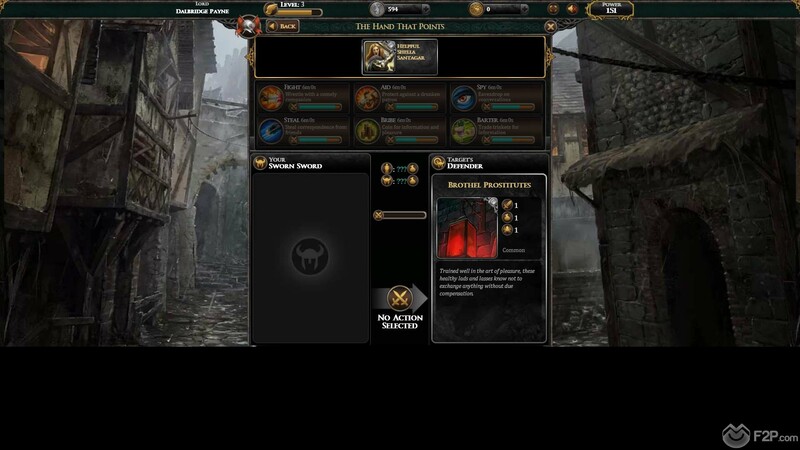 Away from the story element the mechanics focus primarily on acquiring resources, either through quests or from your own production buildings that you must unlock as you level up and purchase with silver, that I used to create a variety of resources or items (e.g. weapons and armour from the Blacksmith) that can be traded, used in quests or assigned to particular Sworn Swords. 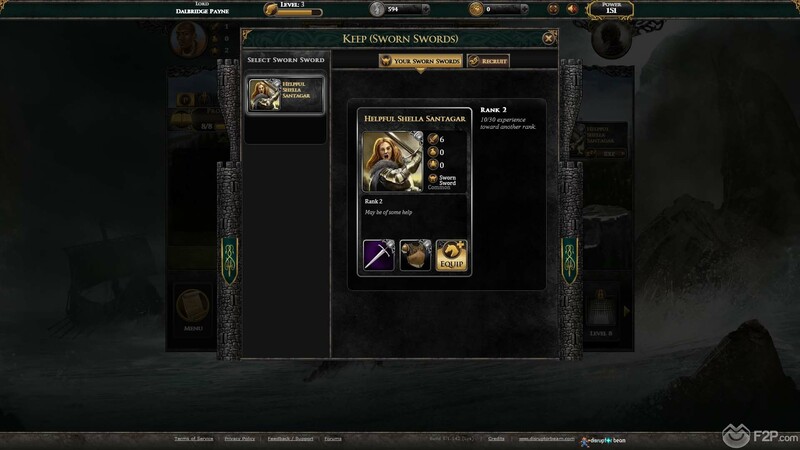 The Sworn Swords effectively represent the House in a more manageable manner compared to the NPC advisers that players also acquire, Sworn Swords are recruited by spending silver and gold and come with different base stats focusing on combat, trade and intrigue, which will determine how they best handle different missions and tasks. As well as their base stats these Sworn Swords can be equipped with various items to improve them, the basic Sworn Sword that we could afford was pretty poor, though they do level up and increase their abilities with successful missions. However, as we registered during the Fire & Blood expansion we were gifted a Legendary quality Dragon Figurine item which made us completely overpowered for the early game quests by about 20 fold. Without this item the missions may have been considerably harder for a time, though in the later game you do need multiple Sworn Swords due to some of the missions taking hours to complete (and even days) and so we started to know just how hard these quests could be without our epic item. One of our early Sworn Swords lost quite a few of their engagements, taking multiple wounds as a result and, if left unhealed and if they subsequently took on more wounds the Sworn Sword could actually die. Though we didn’t get to experience it the endgame focuses more on PVP and creating House Alliances with other players as well as conducting missions against them with your own Sworn Swords or having greater Alliance vs Alliance battles. 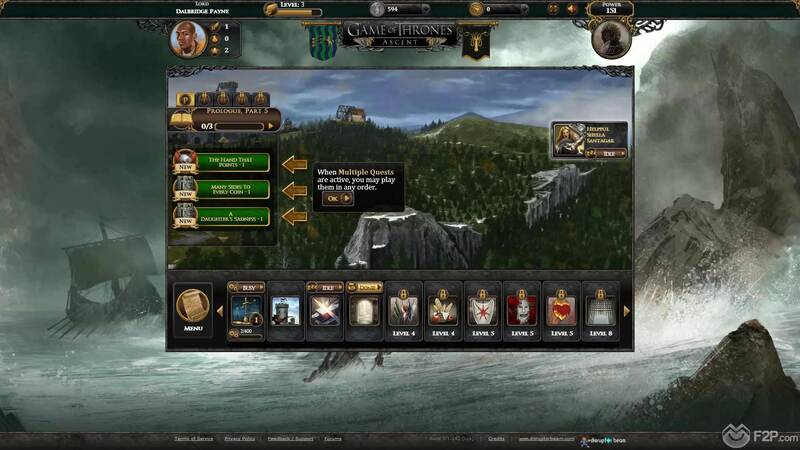 There is an extensive storyline that players will complete as they progress through the game, revealing many of the major storylines within the series as their own characters, becoming a key political figure in the scramble for the Iron Throne. We were surprisingly entertained by the game, though the systems and mechanics are a little on the basic side it was a least enjoyable for a browser-based strategy, albeit our enjoyment mostly came from the setting and storyline and the actual functions and features that we unlocked; and this is what we think the biggest problem with the game is. Without the Game of Thrones franchise behind it we not sure how interesting the game would have been, for us the fun was in meeting some of the key characters we’ve read and seen from the series, visiting important locations and taking part in some of the key events. If you’ve never read the books or watch the show then playing this game will simply spoil the major events, elude to many of the minor events, without having the full depth that the books and TV show deliver them with. If you have read/watched the series then you already know everything that is going to happen and so all you are really playing for is the experience of being a House in that particular setting during those particular times, and we feel that is a very niche target audience. The artwork is great and sets the tone extremely well, the music score is directly from the TV show and so most definitely creates a more immersive experience (for those that have watched the show) and so even with our reservations with say, providing you have read watched the series, it’s worth giving the game a try.